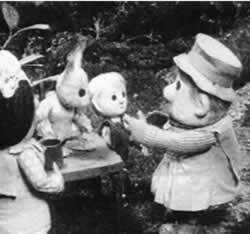 Pogles' Wood was screened by the BBC from 1966 to 1968 as part of the BBC's Watch with Mother series. Prior to this in 1965 The first story in the series " The Pogles" was shown once but never repeated. In many respects this was the best story ever told featuring the Pogles but it was considered a little too scary for small children. "The Pogles" has remained in storage for the best part of 40 years and until recently it had not even been seen by its creators. Follow the video link to find out more. Please have a jolly good click around this site. There are a number of bonus features contained deep within the pages.